Individuals and Businesses committed to helping artists. They are other artists, music lovers, promoters of independent local talent and advocates for undiscovered artists worldwide. clubs, cafes, recording studios, hotels, instrument stores and concert venues. i'm Believers . . .
support independent music and help all artists to be Heard & Found. rate artists' songs, genre, explicit content and age appropriateness values. review new artists' areas before they go live. notify our staff of copyright infringements and website abuses. host IndiependenceMusic.net local singer-songwriter open mic nights. place posters at businesses that support independent musicians. spread the word about IndiependenceMusic.net in their local community. talk about our site via internet chat rooms, forums, websites, etc. identify and attend local festivals on behalf of IndiependenceMusic.net. coordinate local IndiependenceMusic.net promotional efforts. free i'm Believer Logo t-shirts, hats, jackets and other merchandise. "i'm Money" compensation for purchasing music and merchandise. free attendance at local concerts, jams and festivals. cash payments for hosting open mic nights in your town. part time paid employment positions when available. 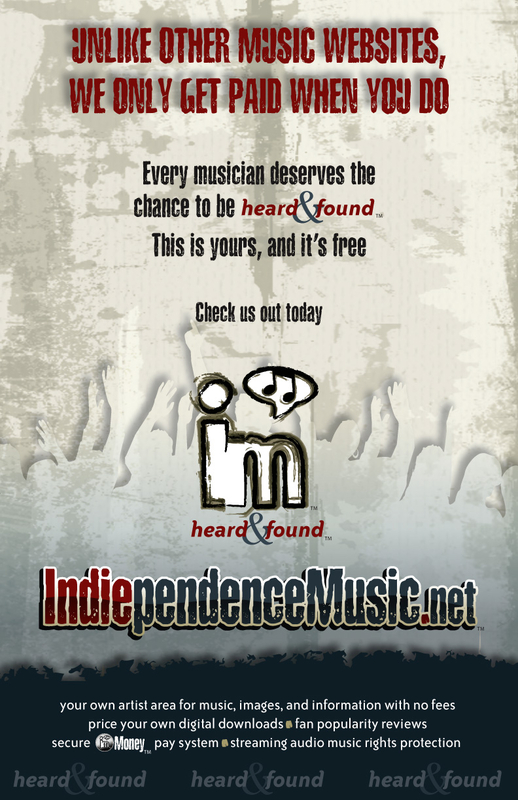 a free "yournamehere@indiependenceMusic.net" email address. a link to your artist area on the "i'm Believer" pages.